Not only are there too many Illinois films to cover in one post, there are too many films made in the city of Chicago to cover. Perhaps only New York City has been the location of more films than Chicago, but since one of our goals this year is to visit a bar in every state, we thought we’d remember a time in our nation when such a task would have been more difficult and far less legal. We’re limiting our films to those set in the Prohibition Era in Chicago. And there are plenty. Brian DePalma’s 1987 film, The Untouchables, is really based more on the popular TV show than the true story of Treasury Agent Eliot Ness’ battle against bootlegger Al Capone. If someone doesn’t mind how the film strays a bit from the truth (Ness didn’t cold bloodedly kill Frank Netti, who lived on in Chicago for years after Ness left), this is a rousing film, an urban Western. 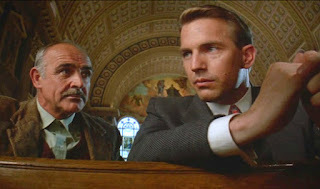 Kevin Costner is great as Ness, as is Robert DeNiro as Capone, but it was Sean Connery who won an Oscar for playing a fictitious policeman. David Mamet wrote a screenplay full of memorable lines and interactions. Ennio Morricone’s score is stirring and similar to his music for spaghetti Westerns. But best of all is DePalma’s direction of a number of memorable set pieces including a wonderful steal of Sergei Eisenstein’s staircase montage from Battleship Potemkin. Capone’s Chicago days have provided material for a number of films. In 1959’s Al Capone, the gangster was played by Rod Steiger (if you were a member of our household, you would remember him as the protagonist of the film Oklahoma). In 1975’s Capone, Ben Gazzara played the famous thug. An unusual choice in making that film was also showing Capone in the years following his imprisonment. In 1967’s The Saint Valentine’s Day Massacre, Jason Robards played Capone in a film which focused on Al’s slaughter of the Bugs Moran gang on the day that is supposed to be all about love. That awful event is recreated in a very different setting in Billy Wilder’s classic 1959 comedy, Some Like It Hot, in which musicians Jack Lemmon and Tony Curtis witness the killings and go into hiding as members of an all girls band. Sometimes pseudonyms were used for a Capone-like character. The mobster was still alive in 1932 when Howard Hawks made Scarface. “Scarface” was a nickname for Capone, but Paul Muni plays a character named “Tony.” The film is set in Chicago, but when the film was remade in 1983, Brian De Palma used Florida as the setting and made it about the prohibition of drugs rather than alcohol. Two classic gangster films were made the year before the first Scarface which were also set in the Windy City: Little Caesar, launching the career of Edward G. Robinson; and The Public Enemy, which was Jimmy Cagney’s big break. All three of these films were very popular -- but also were considered very violent. 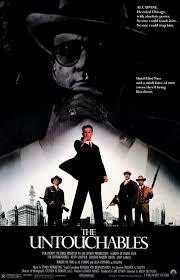 There was a concern in the government, the press, and the church that these films glorified the life of the gangster. Along with the early Universal horror films, these helped usher in the censorship of the Hayes Code. The gangster life during those prohibition years in Chicago has continued to be a popular theme. In 2002’s Road to Perdition, Tom Hanks and Paul Newman played hoods in a story based on a graphic novel. Perhaps the strangest film of all time set in this place and era is 1976’s G-rated musical, Bugsy Malone. All of the roles, including the gangsters and molls, are played by child actors (such as Scott Baio and Jodie Foster). To keep that G rating, the guns in the film shoot whipped cream instead of bullets. A couple of other films set in the time of prohibition are not about gangsters, but are still about criminals. 2002’s Oscar winner for Best Picture, Chicago, is about murderesses in the early 1920’s who were heroines in the tabloid press. The movie musical was based on a Bob Fosse musical and won five additional Oscars, including Best Supporting Actress for Catherine Zeta-Jones. But the story told in that musical had been told on the screen before. In 1942, Ginger Rogers played Roxie Hart in a film that featured her trial on the charge of murder. Because of the Hayes Code brought about by those gangster films, a movie couldn’t portray someone getting away with murder. So Roxie, in the film, was innocent. We sometimes think of the past as a more innocent time…but Prohibition Era Chicago…not so much.